If you follow the stock market, you are likely to hear people boasting that their buy and sell strategies allegedly only generate profits and never losses. Anyone who has read A Random Walk down Wall Street  knows that wild stock market speculation only leads to player bankruptcy in the long term. But what about the few fund managers who have managed their deposits for 20 years in such a way that they actually score profits year after year? According to A Random Walk down Wall Street, even in a coin toss competition with enough players, there would be a handful of "masterly" throwers who, to the sheer amazement of all other players, seemingly throw heads 20 times in a row without tails ever showing up. But how likely is that in reality? It is easy to calculate that the probability of the same side of the coin turning up twice in succession is 0.5x0.5 (i.e., 0.25), since the probability of a specific side showing once is 0.5 and the likelihood of two independent events coinciding works out to be the multiplication of the two individual probabilities. The odds on a hat trick (three successes in a row) are therefore 0.5^3=0.125, and a series of 20 is quite unlikely at 0.5^20=0.000000954. But still, if a program only tries often enough, it will happen sometime, and this is what I am testing for today. The short Python coin_throw() generator in Listing 1  simulates coin tosses with a 50 percent probability of heads or tails coming up. Listing 1 is divided into the coin_throw() coin toss generator and the experiment evaluation in the experiment() function. In a for loop as embedded in line 16, it looks like coin_throw() would return a long list of result strings consisting of heads or tails, but in reality, the function is a dynamic generator that returns a new value whenever an iteration pump like the for loop asks if there is more coming. How does the generator, whose output is shown in Figure 1, work? The key is the yield command in line 8 of Listing 1. Python interrupts the execution of the current function for a yield, remembers its internal state, and returns the string (heads or tails) to the calling program in line 8. The randint(0,1) method returns the integer value or 1 with 50 percent probability, and the script picks one of the two entries in the sides tuple. Figure 1: Python generator coin toss. The next time the coin_throw()function is called, the program flow returns to the previous location within the function to continue where yield left off. In this case, this is the endless loop with while True in line 7, whose condition is still true, whereupon another yield command again returns a random value. Thus the generator produces an endless sequence of values in coin_throw() and always performs a new coin toss if the for loop in the main program wants more. 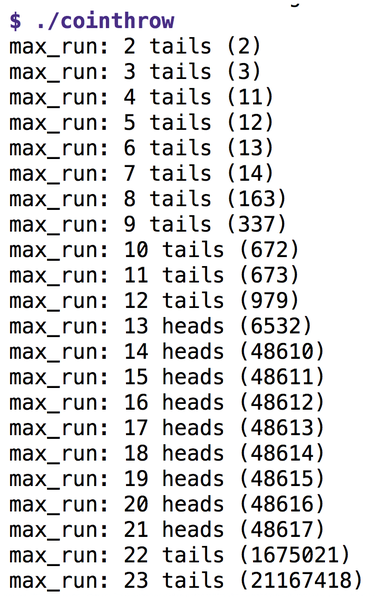 The experiment() function's remaining code stores the number of identical coin toss outcomes in sequence so far in the variable run, the maximum longest sequence so far in max_run, the previous coin toss in prev (heads or tails), and the total number of tosses so far in count. The output from the script in Figure 2 reveals that after 21 million passes, a sequence of 23 tails in succession actually occurred. If a player had doubled the bet for the next game each time they lost, a strategy called "doubling down," they would have needed a total of 2^23 – 1=$8,388,607 of betting capital, assuming an initial bet of $1, not to go bankrupt if they had initially bet on heads, only to see 23 tails in a row with growing frustration. Figure 2: Longest sequences of identical coin tosses.